The iconic world-renown lesbian event – the original Dinah Shore Weekend – is celebrating its 24th Anniversary by upping up the volume more than a notch, and scoring a sizzling coup for its high-profile party on Saturday night. 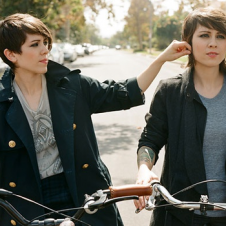 Keeping the festivities at the Palm Springs Convention Center – the desert’s largest concert venue – twin sisters Tegan and Sara will headline the famed soiree on Saturday, April 5, 2014. Canadian-born, lesbian cult favorites Tegan and Sara Quin have been on an unstoppable meteoric rise since the release of their 7th studio album dubbed “Heartthrob”, which debuted at #3 on the Billboard 200. The band’s lead single “Closer” has broken into the Top 20 on the Pop Charts, is currently on rotation on over 150 Top 40 radio nationwide, and week after week keeps a solid spot on the VH1’s Top 20 Countdown. As ardent LGBTQ rights advocates, it’s only fitting the duo will bring their world tour to the largest lesbian event in the world: Club Skirts Dinah Shore Weekend. Posted January 7th, 2014 & filed under Entertainment.